This page will explain how to import and convert templates, used in Creating an Encounter, from older versions of TRAKnet into TRAKnet 3.0. Templates from previous versions of TRAKnet can be imported and converted into a readable format for TRAKnet 3.0. The import templates feature is located under the UserName in the upper right-hand corner of TRAKnet 3.0, labelled Import TRAKnet Templates. This allows for templates from pervious versions of TRAKnet to be imported and converted into the new TRAKnet 3.0 format. From the main screen in TRAKnet 3.0, left-click on the (UserName) in the upper right-hand corner. From this drop-down menu, select “Import TRAKnet Templates.” This will open the Template Management screen. Template Type – This drop down menu will determine what category the template belongs under. For example, this could be a Diagnosis Template, a Treatment Template, or an Encounter Template. Folder – This drop down menu will pre-populate with the information from your TRAKnet 2.0 template and will correspond with the folder that template is currently located in. Name – This field will be where you can enter a new name for this template. Save New Template – This option will save the newly imported and converted TRAKnet template. Practice Template/My Template – This toggled option will determine if the imported template is a practice-wide template or a user-specific template. All Templates/Diagnosis/Treatments – These tabs in the left-hand column of the Import TRAKnet Templates screen will contain all templates currently loaded into your TRAKnet 2.0 database. Edit/Format/View/Insert/Table – These drop-down menus will allow for the customization of your TRAKnet template. The central portion of the Import TRAKnet Templates screen will allow for customization much like any word processing software. Fields/Links – These menus along the right-hand portion of the screen will allow for the insertion of additional data fields into the template. Before beginning, select the Encounter Forms template type if you are importing a template from the All Templates tab. To select a TRAKnet Template to preview and convert, from the All Templates tab in the left-hand portion of the screen, select the corresponding folder that will contain your desired templates. These folders will reflect what is currently present in your TRAKnet 2.0 database. Selecting a template from this menu will open the template for customization and conversion in the central portion of the Import TRAKnet Templates screen. To automatically convert data fields into the new TRAKnet 3.0 format, click “Convert Template” in the upper-left corner of the Import TRAKnet Templates screen. All converted data fields will change from a [format] to the new «format». Any data field that does not convert to a «format» will need to be manually converted utilizing the various “Fields” and “Links” in the template editor. TRAKnet 3.0 will allow you to convert an entire folder of templates from a previous version of TRAKnet. To do this, from the top of the screen select “EncounterForms” from the TemplateType drop down menu, then select the folder you would like to convert form the list of TRAKnet 2.0 folders along the left-hand side of the screen. Once you have done this, click the “Convert Selected” button on the top of the screen. This will convert the entire folder of templates. If any templates have been converted from that folder in the past, the system will notify you, asking if you would like to replace the already existing template with your newly converted one. Fields – These data fields will contain various generic data fields on a variety of non-patient specific topics. For example, Yes-No answers, Pos-Neg answers, etc. You can also create multiple choice selections or single choice selections with the “Select Multiple Options” or “Select One Option” fields. Once you insert this field, simply list your desired data in the pop-up window, separated by a comma. Links – These data fields will pull over specific information pertaining to the visit and are broken down into several categories. 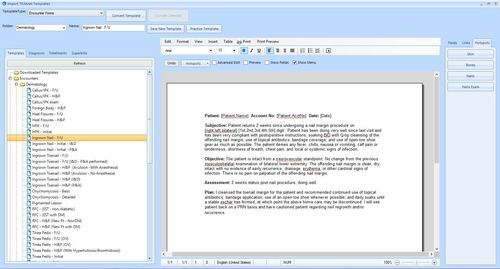 Patient Fields – These fields are used to populate relevant information to that patient such as Age, DOB, and Name. Patient Data – These fields will pull over medical information pertinent to the patient, such as Patient History, Lab Results, Active Medications and Allergies, and Primary Diagnosis. Visit Fields – These fields will allow you to populate visit specific information in the note, such as ROS, HPI, and more visit specific fields such as Visit Date, Problems, or Provider. Misc. – These fields contain any information that is not patient or visit specific, such as Practice information and UserName fields. Billing – These fields include billing related information such as Marital Status, Legal Representative, and Monthly Due Date. Once a template has been converted and updated as need, you must save the template to confirm your changes. To save a finished template, click “Save New Template.” You may override the current name of this template at this time. A pop-up window will appear indicating the template was saved. Click “OK.” You may now select another template to convert and modify, or click the “X” at the top of the screen to close this window. You are also able to import and convert the templates which are behind your diagnoses codes. To do this, select the Diagnosis tab in the Import TRAKnet Templates screen. To select the template you would like to import and convert, place your cursor into the search box and type in the code for the diagnosis you would like to import and click search. The template will appear in the list beneath the search box. Click on the template to preview the template behind that diagnosis code. To convert the template into the appropriate TRAKnet 3.0 format, click the Convert Template button in the upper left-hand corner of TRAKnet. Once you have converted the template, make any necessary changes or corrections to the body of the template, and click Save New Template. This will save the template for your diagnosis. As with diagnosis templates, you are also able to convert and import treatment code templates. This can be done under the Treatments tab of the Import TRAKnet Templates window. To select the template you would like to import and convert, place your cursor into the search box and type in the code for the treatment you would like to import and click search. The list of possible treatment templates will appear beneath the search box. Select the template you would like to convert an import to preview that template. To convert the treatment template to the appropriate TRAKnet 3.0 format, click the Convert Template button in the upper left-hand corner of the window. To then save this template in the new TRAKnet 3.0 format, click Save New Template. Superbill templates from TRAKnet 3.0 can be converted into a format appropriate for use in TRAKnet 3.0 as well. To do this, select the superbill template you would like to create in TRAKnet 3.0 from the dropdown menu at the top. Using the body of the superbill in the middle of the screen, make any of your desired changes. Select the 2.0 superbill you would like to import the codes from in the list on the left-hand side of the Import TRAKnet Templates window. Place your cursor into the body of the superbill where you would like these codes to import. Click Diagnoses Text where you would like the diagnoses code portion of your superbill to populate. Click the Treatments Text where you would like the treatment code portion of your superbill to populate. Click Convert Superbill. The Diagnoses Text and Treatments Text placeholders will now convert over your Diagnoses and Treatments from your TRAKnet 2.0 superbill. Rename the superbill as needed, then click Update Template. Your superbill will now be available in any location where printing superbills is available in TRAKnet 3.0.